For many of us, the vehicle we drive is an extension of our personality. It not only gets us down the road, it gives us the ability to live our life how we want and pursue our passions. From cross-country road trips to hunting or camping adventures, the right vehicle can make it all possible. That is why BLVD.com is featuring All Terrain Conversions (AT Conversions) this week as they are revolutionizing the mobility industry with accessible trucks, SUVs, and Crossovers. Some of the benefits of wheelchair trucks, SUVs, and Crossovers may be surprising to those who just know about handicap vans. Compared to the standard wheelchair van, truck and SUV conversions can have better gas mileage which can make both your wallet and the environment happy. The undercarriage clearance is greater on converted trucks and SUVs because unlike the minivan the factory ground clearance is unchanged. This also helps with reduced road noise and off road capabilities. Safety is a big priority for AT Conversions and their conversions are rated higher than most minivans. Additionally, wheelchair users will be pleased to know that most truck and SUV conversions fit any mobility device. AT Conversions utilizes a specialized hydraulic lift system within its conversions. The redesigned lift operates with a single remote making it very easy to use with the load and unload time being just 15 seconds. The Gull Wing door that opens requires less space than a minivan ramp and also protects the user from the elements when loading and unloading. AT Conversions stands behind its hydraulic lift technology stating that the quality and design (which is similar to the lifts used in airplanes) was created to outlast the lifetime of a durable truck. 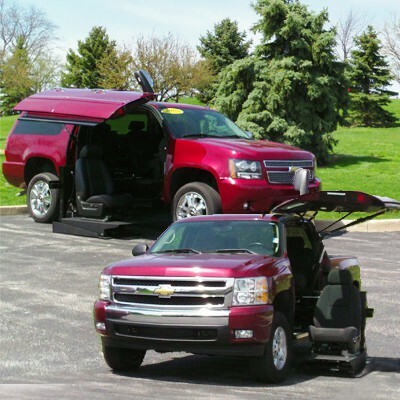 This is typically not the case with the electric lifts in other accessible vehicles on the market which require more service and maintenance than compared to an AT Conversions vehicle with hydraulic lift technology. AT Conversions specializes in converting GM trucks, SUVs and Crossovers from 2008 to present such as Chevrolet, GMC, Buick, and Cadillac. Depending on if you prefer Chevrolet or GMC, you can choose between the Chevrolet 1500, 2500 and 3500 and the GMC 1500, 2500, and 3500. From there, you can choose to convert either the driver or passenger side of the vehicle with the lift. These conversions start at $23,900. To view photos and videos, click here. For SUV options, AT Conversions can modify the Chevy Suburban, GMC Yukon XL, or the Cadillac Escalade. Prices for these conversions start at $29,900 and you can also choose to have either the driver or passenger side converted. A popular size and alternative to the truck or SUV is the Crossover. Your choices will be a Chevy Traverse, GMC Acadia or Buick Enclave for conversions. This is the most affordable option with prices starting at just $19,999. These crossovers are similar to the interior of a minivan allowing wheelchair to be positioned on driver side, passenger side or middle row. Their big advantage is the ramp/lift is inside the cabin. With a push of a button, the floor of the vehicle literally drops forming a ramp. This eliminates the five foot ramps typically extended from the side of the minivan which allows the wheelchair user the ability to park in a standard size parking space. You can see how this works by clicking here. AT Conversions can upgrade your SVM or GoShichi Truck using their hydraulic lift technology. The process is very simple and you can either have your current system converted from an electric to hydraulic system (starting at $9,999) or completely replace your current system to the hydraulic lift and Gull Wing Door (starting at $17,900). Either way you decide to go, you will have the 5 year/50,000 mile warranty from AT Conversions. AT Conversions’ website has a full breakdown of all the pricing per vehicle so you can see what your options are for each type of conversion. You will work with an AT Conversions team member to complete a Quantifying Worksheet which will require measurements from your wheelchair or personal mobility device to ensure proper fit with the conversion. There may be limitations on certain 4 wheel drive vehicles. Production time for most conversions take up to six weeks however AT Conversions is ramping up production resources and will decrease that time in the near future. Custom conversions are available however could result in additional cost and production time. To learn more about warranty and safety information, click here. For all of the above, be sure to consult with your AT Conversions dealer for specific recommendations and assistance. AT Conversions can be found all throughout the country at either an authorized dealer or other dealers who keep AT Conversions stock in their inventory. For a complete list of locations, you can click here. You can also contact AT Conversions directly by submitting your contact information and get started on your dream truck, SUV, or Crossover conversion today!